Are you looking for an experienced, reliable, and affordable floor cleaning service company in the Greater Houston area? If so, Modern Stone Care has got you covered! We are the leading floor cleaning company in Houston, primarily focusing on servicing tile and natural stone flooring. While we work with all types of natural stone flooring, we specialize in granite, travertine, marble, limestone, and slate flooring. Our services extend beyond just cleaning, we also provide floor sealing, honing, polishing, and restoration services. 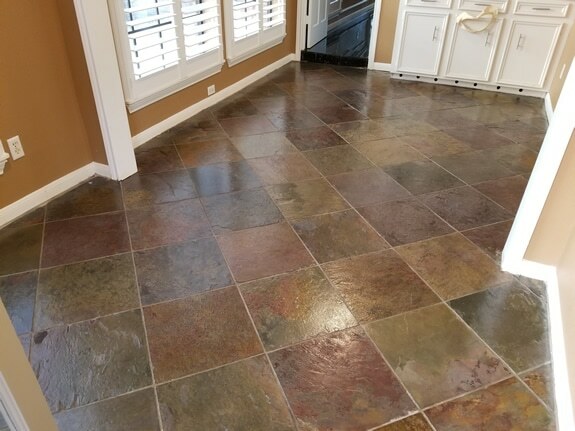 We know how much of an expense flooring throughout your home or business can be and this is why we work so hard to maintain and preserve their beauty, to protect your investment. Natural stone makes for some of the most undeniably gorgeous flooring. However, alongside with that beauty comes the need for regular maintenance. You are only able to maintain and preserve these precious floors with proper upkeep. Most natural stone is porous, making is more susceptible to staining and damages. This is why we recommend your natural stone floors are sealed annually, or biannually for those who put more wear and tear on their homes. Sealing your natural stone helps to keep it cleaner and last longer. This is because it is putting a clear barrier between dirt, dust, grime, and spills. Whenever we clean your floors, we can let you know if they are in need of a seal. It is important, when you have sensitive flooring, such as natural stone, that you are working with a cleaning company that is aware of the sensitivities of your particular flooring materials. Many companies who claim to be able to clean every type of floor are unaware of how much damage they can cause if they mistreat certain types of flooring. Modern Stone will always be upfront and transparent with our clients when it comes to our knowledge and ability to provide cleaning and maintenance services.